Performing: Friday, June 8th, 11:00 p.m.
Twinprov: Rap-sody is real-life twins Clint and Buck Vrazel improvising a comic hip-hop romp through time, space, and culture – and if you know the words, sing along! Our duo pushes groupmind and storytelling to the limit with seamless scenic, character, and lyrical swapping, often rapping while doing so. Named by Metromix Chicago as one of the 10 Can’t Miss Shows at the 2011 Chicago Improv Festival, Rap-sody is an original musical long-form in which an audience suggestion is dynamically explored and expanded upon through a series of interwoven improvised scenes and hip hop. Rap-sody often manifests as narrative, vignettes, or Harold. Featuring intimate character moments, absurd physicality, and high concept exploration of the most epic and mundane ramification of ideas, Rap-sody pushes the philosophical and rhythmic boundaries of improv. Formed in 2009, Twinprov is a nationally-recognized one-of-a-kind comedy troupe made up of two-of-a-kind twin brothers Buck and Clint Vrazel that specializes in creating reality-altering musical improv. These clone comics absorb and warp ideas from pop-culture, movies, games, history, philosophy, science and math to create smart, challenging, off the wall comedy that can’t be duplicated. 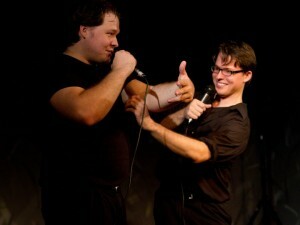 The Vrazels have been performing and teaching improv for 12 years and are a driving force in the Oklahoma improv scene. They are co-artistic directors of OKC Improv, the state’s premier professional improv showcase and learning institution, where they currently teach classes and perform with numerous troupes including Fortune’s Fools (improvised Shakespeare), The Ones Your Mother Warned You About (relationship long form), ZOOM! (improvised physical theatre), Sketchers in the Wry (original sketch comedy), Villain: The Musical (improvised musical), and Twinprov. As Twinprov, Buck and Clint have performed and taught at theaters and festivals around the country, including: Chicago, Austin, Dallas, Denver, Minneapolis, Seattle, Kansas City, and Honolulu. As their rapper alter-egos The Doppelgangstas, they’ve played several concerts and opened for nerdcore rapper MC Frontalot. Their YouTube videos have garnered over 165,000 views and their “New Moon Rap” was featured on Last Call with Carson Daly. They are the creators of the original musical long-form improv shows Rap-sody, String Theory and Dream Machine.